This yolkless aioli is an intense garlic explosion, and a perfect topper for chicken or potatoes, frittata (Spanish Tortilla) french fries or just with bread while guests are waiting for the first course. 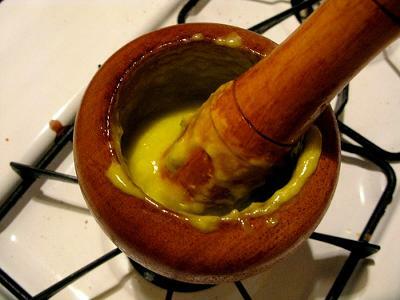 Put garlic and salt in a mortar and pestle and grind until you have a paste. Then, incredibly slowly, begin to drizzle in the olive oil, drop by drop until it emulsifies into a paste and then add more and wait then add more, until all of the oil has been used.